A long time ago in a far-away place in China, caravans from the empire’s interior would carry silk to the western edges of the region. Often small Central Asian tribes would attack these caravans hoping to capture the valuable goods. So from 135 to 90 BC the Han Dynasty extended its military defenses further into Central Asia to protect the caravans. Later the route grew with the rise of the Roman Empire because the Chinese presented silk to the Roman-Asian governments as gifts. Thus was born the famous Silk Road. For a while, trade along the Silk Road declined but revived again in the eleventh and twelfth centuries. Along these road travelled silk and jewels, spices and gold. The caravans needed safe harbors along the route where they could stop overnight and thus grew the idea of a caravan serai. Many were the routes through Turkey and caravan serais dot hills and dales of south-eastern Turkey. 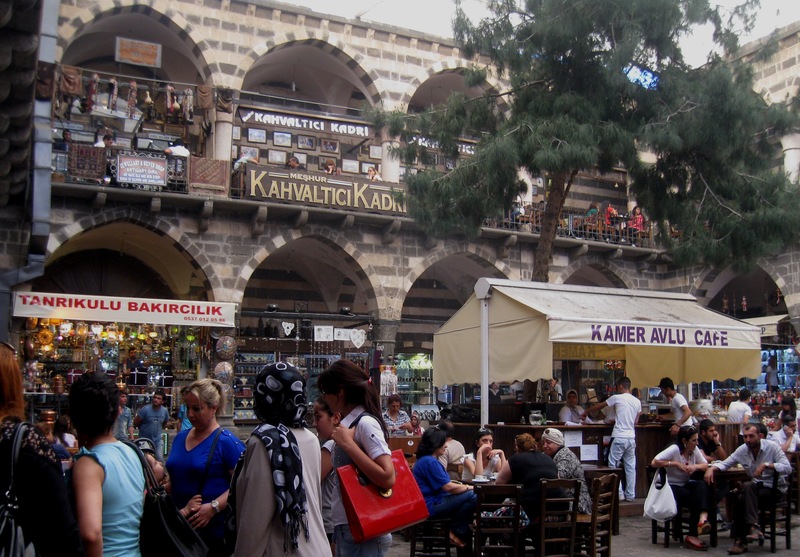 Some are in ruins, some have been renovated, some are now boutıque hotels and many have been turned into cafes and bazaars. 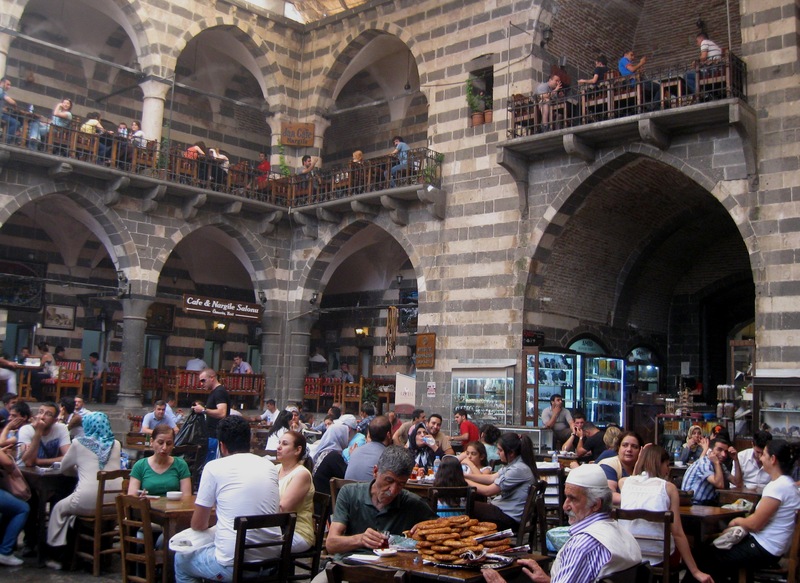 Most of the older cities have one or more and the city of Diyarbakir is no exception. Toward the south of the city, protected by the massive basalt walls ıs one such caravan serai named Hasan Pasha Hani. Large and rectangular in structure, it is constructed of huge blocks of basalt in an alternating black and white rows. Two storeys high, with arched windows along the sides, it has a striking appearance. A few steps lead down from the street level to an enormous archway – the gateway to the inner courtyard. The immense door is studded with metal bars and spikes. On either side of the main entry are doors as well leading to steps that go down into cellars – no doubt used as storage spaces in the days of old. Today too they serve as storage for some of the shops within the serai as well as the kitchens for the many cafes that are housed here. Walking under the archway I enter the huge open expanse of the courtyard. 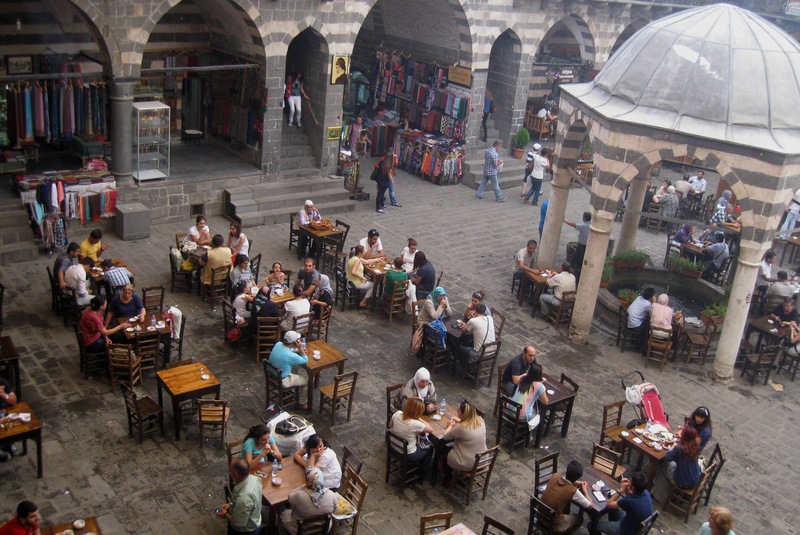 It ıs not the empty expanse of the typical serai but boasts a fountain in the center. Around the fountain are slender pillars supporting a domed roof. Tables and chairs crowd every available inch of the space and just about every table is occupied. Busboys run back and forth from the kitchens balancing trays loaded with tulip-shaped glasses of tea. People – young and old, men and women, entire families with children sit at the tables and the hum of conversation rises above the strains of musıc drifting from one of the cafes. Wisps of smoke from cigarettes and the nargilehs or waterpipes curl up in the air. Across from the entry is another arch and on either side of it are stairs leading up to the second storey. 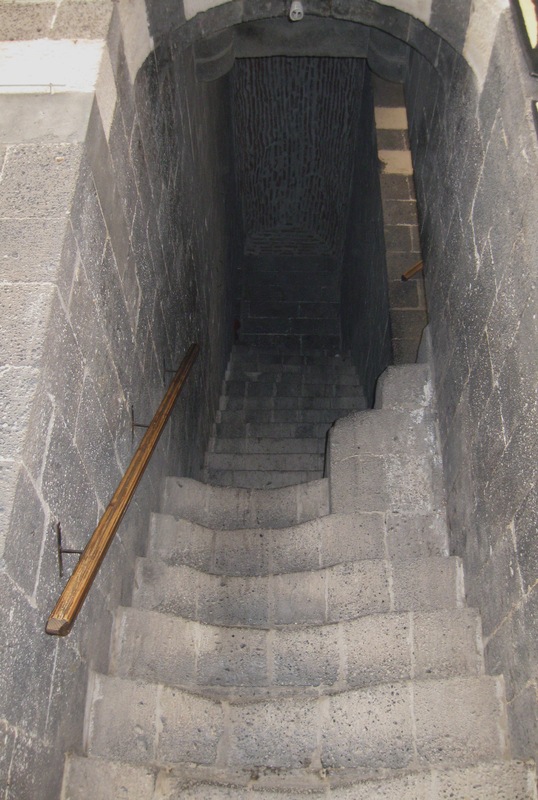 The steps are made of basalt as well and wear a dip in the center from countless feet over the centuries. A wide balcony runs along the perimeter of serai lookıng down into the courtyard below. These too sport tables and chairs crowded with people. Large wide strips of canvas stretch from one end of the roof to the other. They are attached to pulleys and are drawn to provide much-needed shade from the blistering sun. At sunset they are drawn back to reveal flocks of sparrows and starlings dipping and swaying their way to their nests. Along the edge of the ceiling runs a pipe with spouts are regular intervals. These spray a fine mist and makes it wonderfully cool underneath. This method of cooling is as old as the serai and still in use today. Archways open from the upper balcony leading to separate enclosures all along the outer wall. 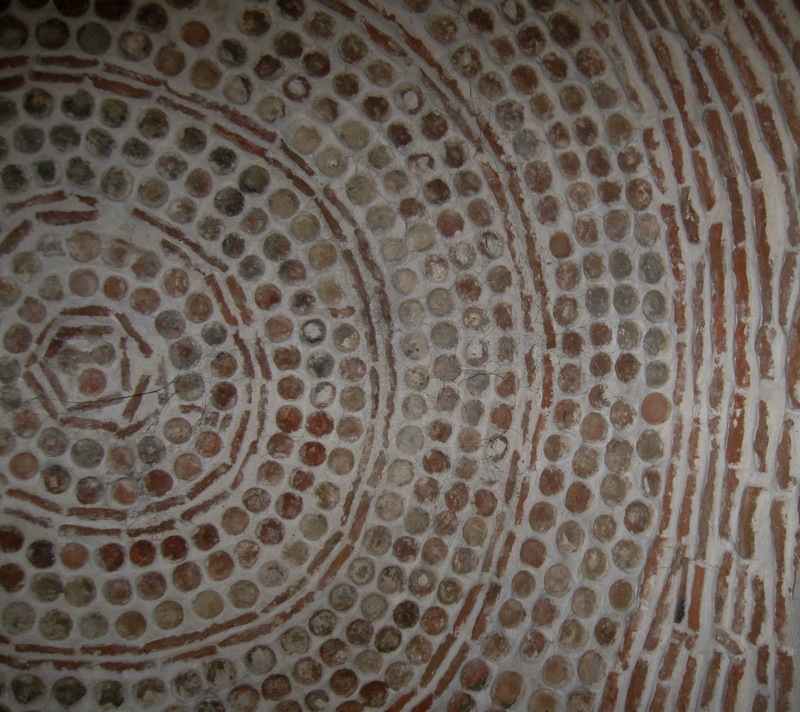 The walls of these rooms too are made of basalt but the ceiling of each is domed. Made of brick, they are carefully layered to gradually come together at top. The placing of the bricks form beautiful geometric patterns. 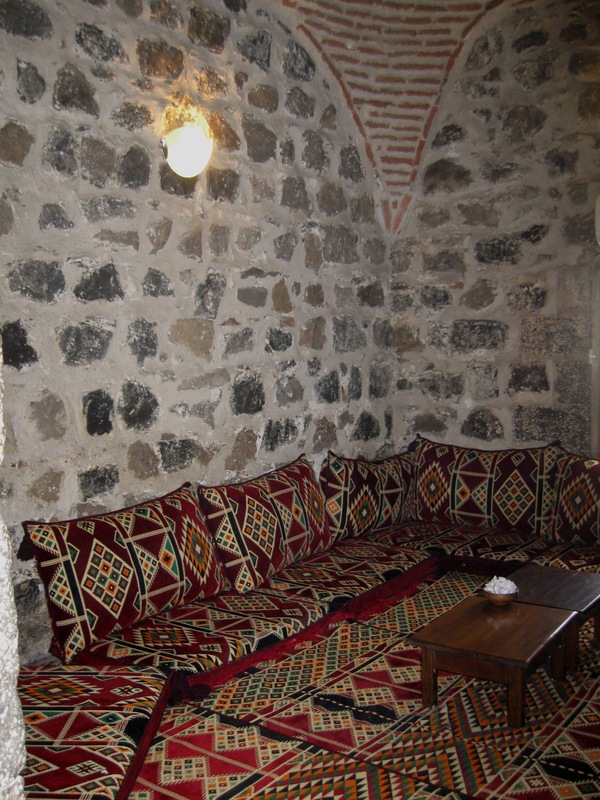 The walls are hung with colorful kilims and old photographs and the floor sports a handmade rug or two. Along the walls are placed plump cushions with yet more cushions to lean back on. Food and drinks are served on low tables placed in front. Like veritable pashas we recline on the cushions and while away the hours.